Bigos is a traditional Polish sauerkraut stew. 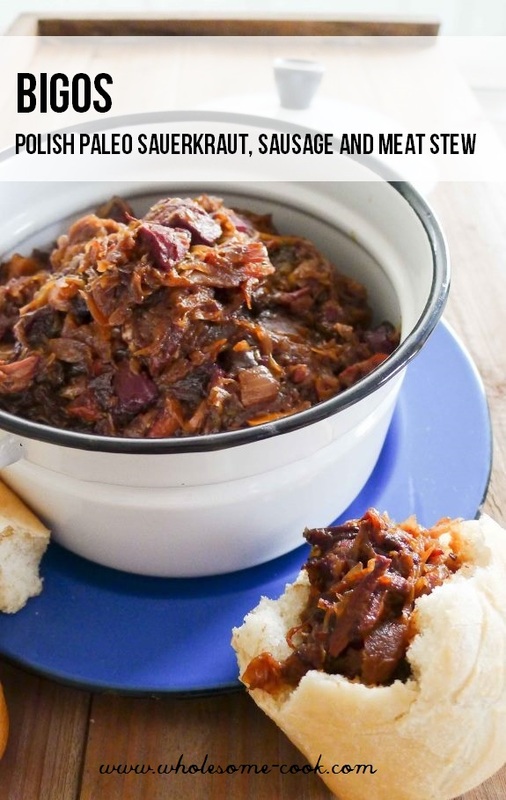 Hearty, sticky and full of meaty flavours of pork, beef, smoked speck and sausages – it’s also Paleo. 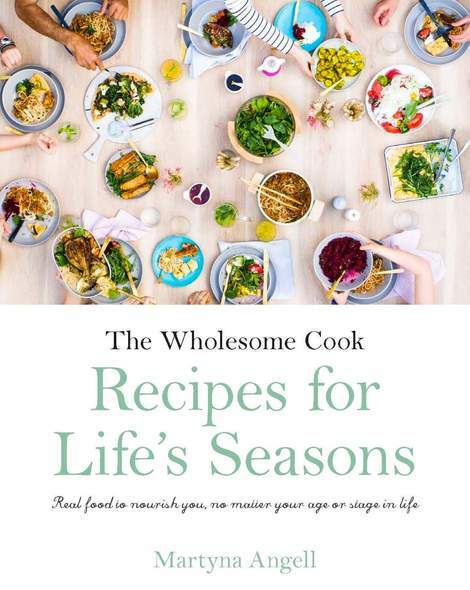 Perfect for the sort of cold and rainy weather we have been having here in Sydney over these past few days. The following rendition of the traditional Polish sauerkraut, sausage and meat stew has come a long way from its peasant beginnings. Spiked with a little red wine for deep colour and flavour and with a helping of lemon zest, it is a more festive rendition of the popular dish. And that much more flavourful. Smoky chorizo instead of traditional Polish juniper or garlic sausage adds a hint of warmth to the dish too. Served on its own if you’re after a Paleo version of the sauerkraut stew, with a nice hunk of sourdough or steamed potatoes for a gluten-free version, it is best made a day ahead and cooked again the next day for an extra 30 minutes or so. But as you know, I don’t like recipes that take 24 hours to make so normally I just cook it once. The flavours and textures are there already, but perhaps not as intense as the would be the next day. Having said that there is sure to be leftovers so feel free to try both and compare. Bigos freezes well, and since it takes a good couple of hours to make, it pays to make a little extra and save it for another day. Move over Reuben sandwich I say! Speaking of sandwiches and gluten free food, I have 5 double passes to the Irresistible Gluten Free Food Show being held in Melbourne 24 – 25 September. To win one of the passes, all you have to do is leave a comment below including a #gf tag in your comment to distinguish you from others. Entries close midnight AEST, Friday, 16 September 2011. Winner will be contacted via email on September 17. While the sauerkraut might loose its probiotic properties due to the cooking, it is still a delicious treat with a slightly tangy-sweet flavour, Don't be put off by the long list of ingredients, most get thrown in at the same time. You can buy sauerkraut (or weinkraut) from most major supermarkets and European delis. I like the Krakus brand because the cabbage is actually quite firm and crunchy and not too sour - or make your own using the recipe in The Wholesome Cook book. Instead of Polish smoked sausage, I used Chorizo which is very similar and readily available from any supermarket. Heat 1 tablespoon oil in a large stockpot over medium heat. Brown onion, chorizo and speck, mixing regularly. Transfer to a bowl. Heat the remaining tablespoon oil over high heat and add the pork and beef. Sear on 2-3 sides and cook for a further 2 minutes. Add sauerkraut together with the cooked chorizo, speck and onion and all the remaining ingredients. Mix well. Cover with a lid, bring to a boil then lower heat and simmer for 1-2 hours or until meat is tender and falling apart to the touch. 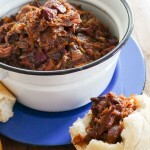 To serve: Spoon bigos into a serving bowl, serve on its own, with mash, green salad or slices of fresh sourdough bread. I’m not entering the contest, sadly I won’t be in Melbourne for some time. (Loved it in 2008.) I loved this post, wasn’t familiar with this dish. Looks like a classic. Delicious for this bitter cold in Springtime! Interesting recipe, I never thought of using sauerkraut as a stew ingredient. Hi Emma, definitely! I don’t actually own one so am unable to advise on cooking times, but it is a one pot slow cooked dish so can’t see why not! OMG pork and prunes? Sounds absolutely heavenly. I’ll be pinning this one to try for sure. and found Bigos. I made it yesterday for tonights dinner, and it is absolutely lovely. We will put Bigos on our ‘favourites’ list. Bigos is a Polish national dish. Every family has their own recipe(s). Nearly all Polish bigos recipes I encountered had tomato paste listed, since it is a winter dish, and ‘back in the good old days’ there were no fresh tomatoes around in Polish winter. But, feel free and inspired. Add whatever you like, Bigos it will be. TIP: Once you have it all (whatever) in your pot and boiling, cover, and lower the flame as far as you can, really. It does not even have to bubble. 80C or 175F is fine, if you have time. Leave it alone for +/- 4 hours. Finally, open lid, stir, reheat to a boil, cover, and after 1 min turn off the gas. Have a good nights rest. Next day, stir cold, reheat to a boil, stirring every now and again, cover again and let boil for a min or so. Turn off the gas and let it sit for 10 mins before lifting lid and serving. Sounds all more complicated than it is. Use common sense and you’ll be fine. Teresa, I love the sourness so I leave all the sauerkraut juice in – but to each his own, I guess. I make mine with regular cabbage and sauerkraut, smoky bacon (the kind you find in a good market deli), polish sausage, fresh mushrooms and dried porcini, onion, grated carrot and some passata. No prunes or wine. I discovered a polish spice mix specifically for bigos but prior to that I seasoned it with things like worcestershire sauce and even oyster sauce. 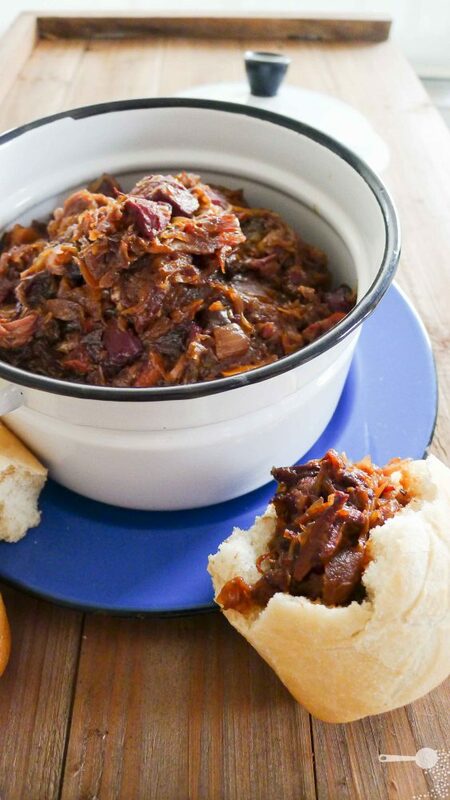 As Filiep said, everyone has their version and bigos lends itself to a lot of variation.